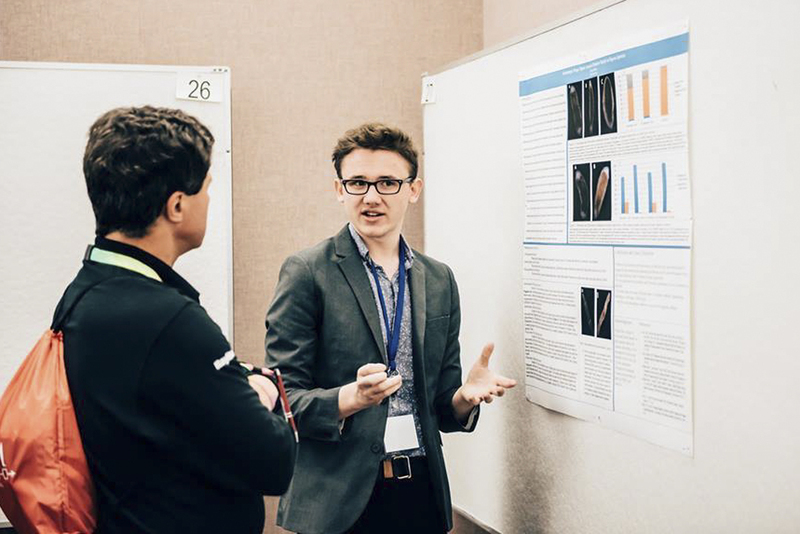 Josh Lapalme presents at the oSTEM National Conference in 2015, held at Carnegie Mellon University. Courtesy of oSTEM. Before he came out as gay to his lab group, Alexander Rowden had to figure out what to say when his classmates asked his opinion on certain female celebrities. “They’d be like, ‘Scarlett Johansson’s pretty hot, right?’ and I’d just say she wasn’t really my type or something,” Rowden, a junior math and computer science major, said. According to Rowden, this is the sort of basic heteronormativity that he and other LGBTQ+ STEM majors on campus want to challenge through the creation of an oSTEM chapter at Pitt. oSTEM, which stands for Out in Science, Technology, Engineering and Mathematics, is a national organization with over 50 chapters nationwide. The group is dedicated to educating and empowering LGBTQ+ individuals working in STEM fields and also provides networking opportunities, academic and professional mentoring and career support for those individuals. The organization provides an online career center, information sessions on professional issues and helps students find financial aid. Cortland Russell, the president-elect of oSTEM’s national organization, said a 2005 IBM-sponsored focus group at the Human Rights Campaign headquarters in Washington D.C. inspired the group to start oSTEM. The organization draws in people who want to find connections between their lives as STEM students and their identities as LGBTQ+ individuals. Pitt’s chapter — with 80 members on its email list, as of this month, according to Rowden — submitted its application to the national body in the past month and is waiting to be approved and recognized as an official chapter. Rowden said once the application is approved, the club will have access to the resources oSTEM provides its chapters, including connections with other chapters and advice on how to build resumes and apply for grants. The club will also send representatives to the oSTEM national conference in Chicago this fall, where they can get in touch with employers and experts in STEM fields. “Once we have access to those resources, it’ll be easier for us to focus on ideas for how to run the club and how to help each other out,” Rowden said. Erin Cech, an assistant professor of sociology at Rice University, found in a 2015 analysis on federal employees that only 2.7 percent of people surveyed in STEM-related federal agencies identified as LGBTQ+, compared to 3.1 percent in other agencies. Cech also found LGBTQ+ employees in STEM-related federal agencies fared worse in their workplace experiences than LGBTQ+ employees in other agencies. Elena Ream, a junior chemical engineering major and oSTEM’s vice president and co-founder, said oSTEM’s top priority is to help its members help its member confidently enter workplaces where they might be marginalized. Pitt junior and computer science major Adam Hayes discovered oSTEM in Nov. 2015 after walking around CMU’s campus and noticing the organization’s national conference there. Soon after, he approached Rowden about starting a chapter at Pitt, and they recruited Ream to assist in the application process and serve as vice president. Ream said that she has heard homophobic or discriminatory remarks made in her STEM-related classes and labs and wants to let students know that LGBTQ+ people are in the room — and are listening. Shayla Goller, a sophomore bioengineering major, first heard about oSTEM in October through a Rainbow Alliance email. “I think it’s great that a club specifically for LGBTQ+ STEM people is now at Pitt’s campus, because so many people in Rainbow Alliance are in the humanities,” Goller said. Rainbow Alliance’s president Peter Crouch said — as a business major — he understands the draw of a group like oSTEM, where students who have had similar experiences can bond and relate to one another. According to Goller, oSTEM has had one meeting so far, an informal meet-and-greet and de-stress session right before finals week last semester. Sixteen of the 80 people on Pitt’s oSTEM email list showed up for food, music and mingling. Goller said she and other board members are putting together a list of dates for general body meetings in the coming year and finding speakers for future meetings. Pitt’s Office of Undergraduate Research, BNY Mellon and some other local businesses have already contacted the group about opportunities for LGBTQ+ individuals in their organizations. “Our first big project that we’re working on right now is compiling a list for our members of employers, especially local ones, that we know are LGBTQ+ friendly,” Goller said. Rowden said that any and all LGBTQ+ STEM majors are welcome, including allies.